Exclusive research from Finance Magnates shows how much Israel stands to lose by cutting off the binary options industry. 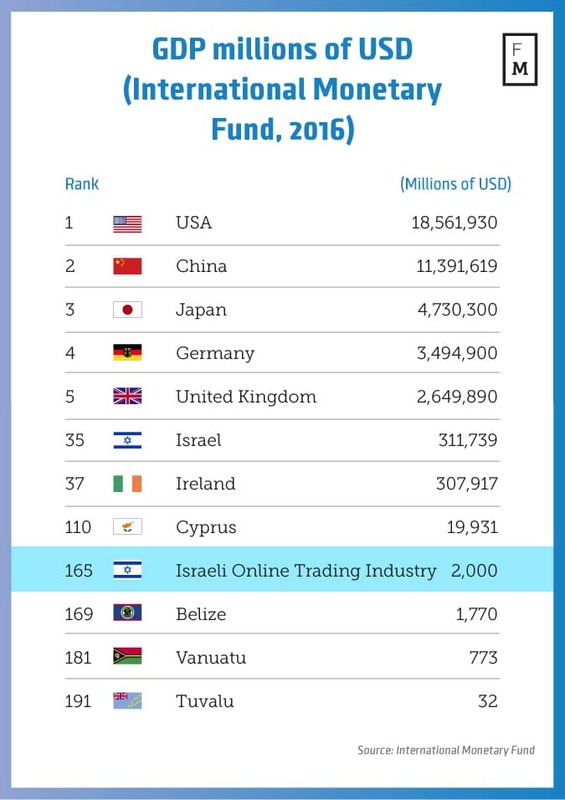 The online trading industry enriches the Israeli treasury with over 2 billion USD a year, representing almost 0.7% of the startup nation’s Gross Domestic Product (GDP), according to Finance Magnates estimates. Breaking down the numbers, we see that the binary options industry alone is responsible for 1.25 billion USD, the remainder coming from its parent forex industry. These industries together employ 8,000 Israelis in a wide range of capacities. Two trends have motivated us to perform this research – the first is the ongoing exodus of binary options brokers and technology providers from Israel in recent years, the second is the mounting regulatory pressure on the industry. Recently, a statement made by the prime minister’s office allegedly urged a worldwide ban on the controversial industry. The storm gathered around the local binary options scene, with a ban on targeting Israeli citizens made by the Israeli Securities Authority last March. 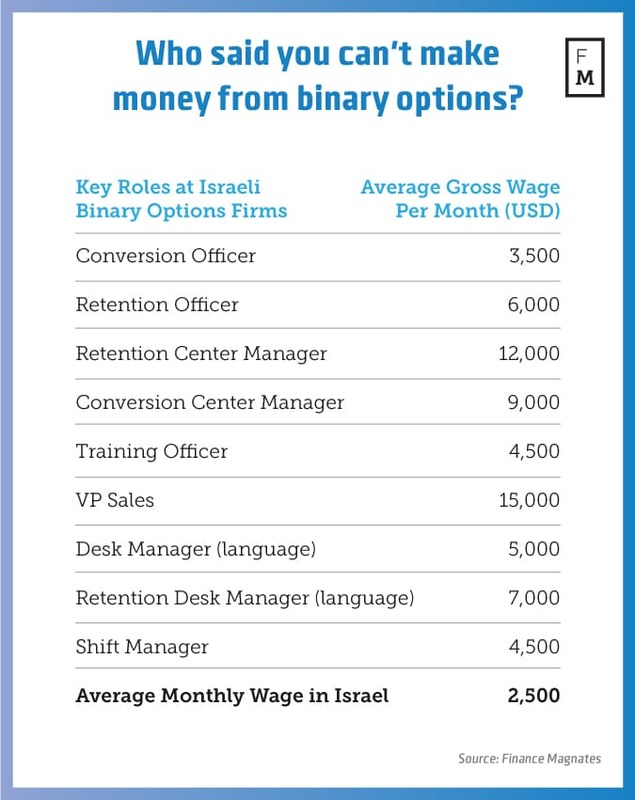 The Israeli binary options industry employs about 5,000 people. We estimate that around 4,700 work for the 70 local active brokers, while the other 300 work for binary options technology providers. 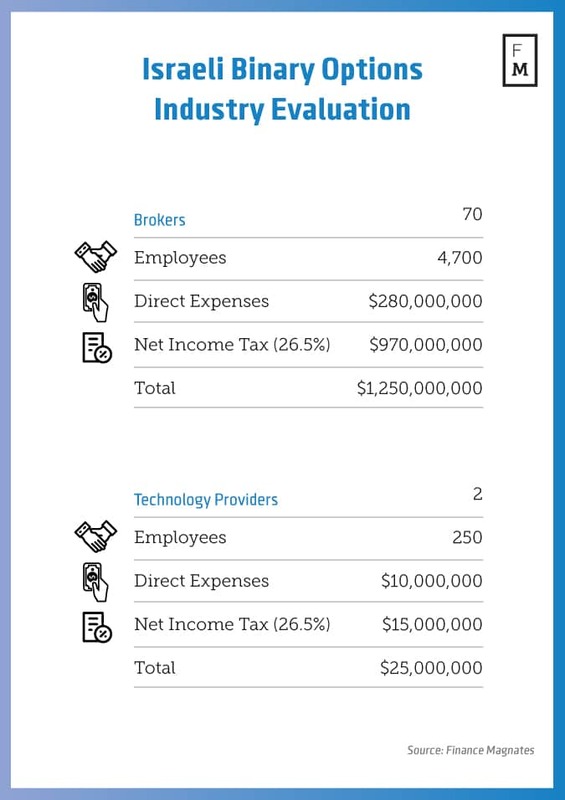 Up to 1.25 billion USD in taxes and other indirect expenses enter the nation’s coffers solely from this industry, as the infographic below shows. Working for the binary options industry can be very rewarding, as monthly wages rise to 12,000 USD for retention managers, 5,000 USD for call center shift managers, and even low rank capacities get paid about 3 – 4,000 USD monthly. To put this into perspective, the average monthly wage in Israel is 9,669 NIS (about 2,500 USD) according to the Israeli Central Bureau of Statistics (Nov 2016). Other than the 70 binary options brokers operating from Israel, there are also two big technology providers that hire about 300 employees – designers, developers, sales and marketing teams, and more. The technology providers, we estimate, enrich Israel’s treasury with 25 million USD annually. Though the ISA awarded licenses for the first time to 6 forex brokers in September, there’s a growing fear in the industry that the bad press brought about by the bad practices of a few Israeli brokers could lead to a total ban of both forex and binary options entirely. If that happens, we estimate that about 3,000 Israelis will lose their jobs as around 50 active brokers and 8 technology firms will be forced to shut down. 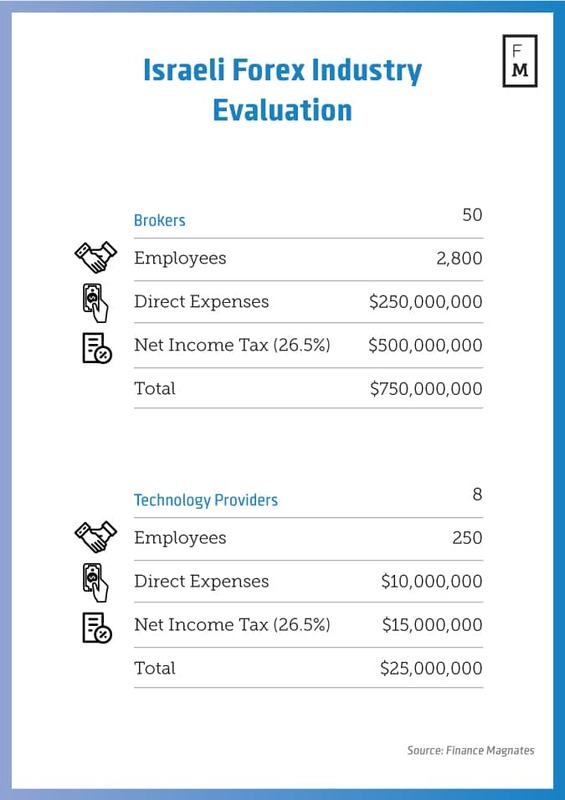 We assess that forex brokers contribute about 750 million USD in taxes and direct expenses to the Israeli economy in addition to the technology providers’ contribution mentioned earlier. Here is the place to admit that our model has a fundamental flaw – it assumes that all brokers pay out of their net income the 26.5% corporate tax required by law, an assumption that we cannot verify. Nonetheless, the above number does represent the amount of money that the state could potentially benefit from should the binary options industry remain unharmed. The potential income from local online trading is high – 2,000,000,000 USD. This is equal to the GDP of the Kingdom of Bhutan, which is ranked 4 places above Belize and 16 places above Vanuatu – themselves hubs for forex and binary options off-shore regulation. Israel is ranked 35th in the world with a GDP of 311,739,000,000 USD. The US holds first place with a staggering 18,561,930,000,000 USD. Michael Greenberg and Janet Pinto have contributed to this article. Good. 1.25 USD Bll of curses out of our back. Like there were not the talent the brains and the bravery to make 10x more that money the clean way in Israel via the Jewish brain. The majority of those employees are Olim whose Israel experience has been damaged and end up leaving the country. What a gain! A gain of bravery exodus. I hope the article is informative and not a marketing representation to legitimize the industry. 0.6% of GDP is NADA. So then Israel would need to legitimize Binary options or cut them off altogether. Oh wait, how can you legitimize a product that was designed to go from the customer’s pocket to the brokers, without any recourse for the customer? There would have to be records and clearing….you know like a real options exchange or derivatives product. I agree with Ron….how much of the actual capital will flow through israel. Offshore entities can hold the cash and then pay employees that way. Any of: (a) legalizing and taxing marijuana; (b) legalizing casinos in certain areas; or (c) getting rid of the VAT exemptions in Eilat would more than make up for the difference (and would be a far more moral source of funding). Taking action on the binary options industry was a case of too little and too late. Not only do the numbers seem off, but there is no description of the methodology used — survey, number of respondents, etc. — nor any reference to specific IMF data that would cite the Israel Online Trading Industry, as used in the third chart. Basic attribution would make or break the credibility of this report.